Regional United (Limerick) 1-1 St Brendans Park Fc , Park Fc won 4-3 on Penalties AET . Inter Kenmare 0-2 Tralee Dynamos . Castleisland Afc 5-0 Killarney Athletic . 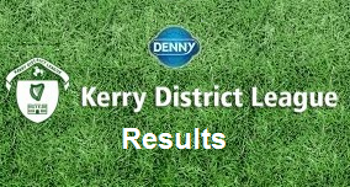 Killarney Celtic B 5-1 Ballyheigue Athletic B .
Listowel Celtic B 2-1 Castlemaine United . Ballyhar Dynamos 5-2 Killarney Athletic B .
Tralee Celtic 3-0 Annascaul/Inch Fc . Mitchels Avenue 3-1 Sporting Listowel . Classic Fc B 2-3 Ballyheigue Athletic . Castlemaine United B 0-3 Abhann Li Fc , Walkover . CS Abbeydorney 7-1 Inter Kenmare B .
Lixnaw Fc 0-2 Windmill United . AC Athletic 1-1 Killarney Athletic . Killorglin Fc 3-0 Killarney Athletic , Walkover . AC Athletic 0-3 Fenit Samphires Fc .